Rebecca is an actress based in Seattle since 2001. She has worked with many local theater companies including Seattle Repertory Theater, Wooden O /Seattle Shakespeare Company, Seattle Public Theater, Theatre Schmeater, Unexpected Productions, SecondStory Repertory, Women Seeking Theatre-West, and Capitol Hill Arts Center. Regionally, she has performed with the Idaho Shakespeare Festival and Salt Lake Acting Company. Film credits include the shorts Mythic Proportions (Cro-Magnon Pictures), Door to Door (Robot Broccoli Productions) and Open House (SIFF Fly-Filmaking). Rebecca has worked extensively in print, television and voiceover with many companies, including HTC, Microsoft, Eddie Bauer, Starbucks, Road Apparel, Top Foods, Tulalip Casino, Taco Time, Electronic Arts, New Balance Shoes, Designer's Furniture Warehouse, and Jim French Productions' live radio series. Rebecca is the founder of a new experimental theater development program, the Custom Play Project, matching local playwrights with local actors and theater artists to write, develop, workshop and produce new work. 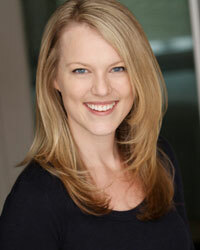 Rebecca is a graduate of the University of Utah Actors Training Program.